I never thought I liked radishes. But then, I had only ever had the ones from the store. Fresh radishes, right from the garden are a completely different thing altogether. But even if you don't like fresh spring radishes, you have to give these a try. Roasted they are yet a completely different version of themselves. The peppery bite almost disappears and their sweetness shines through. So please, go to your farmer's market (or your backyard garden) and get some radishes. Cut them up, add a little olive oil, salt and pepper and give them a quick roast. Wilt the greens and add a little butter to finish them off (because you know butter makes everything better!) You could even get sassy and give them a quick squeeze of lemon. But I prefer mine simple and just a bit salty. MMM! You are going to love it! 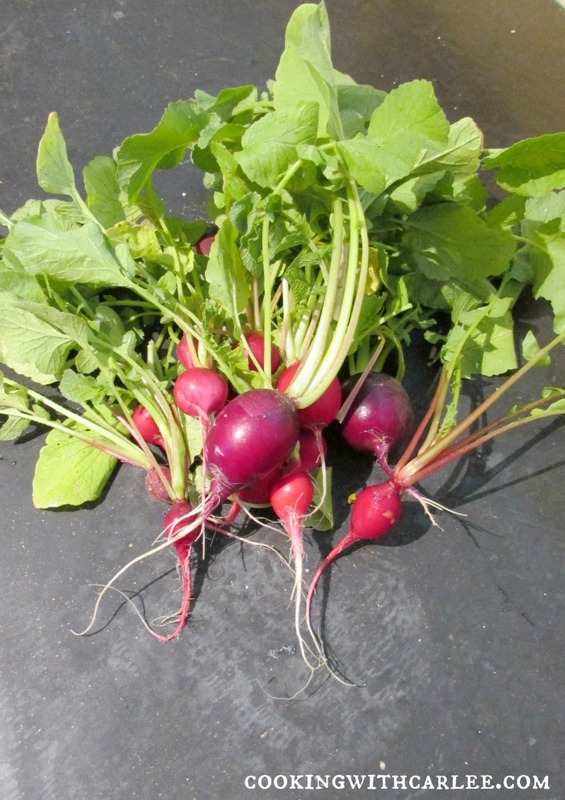 Cut small radishes in half and bigger ones in quarters. 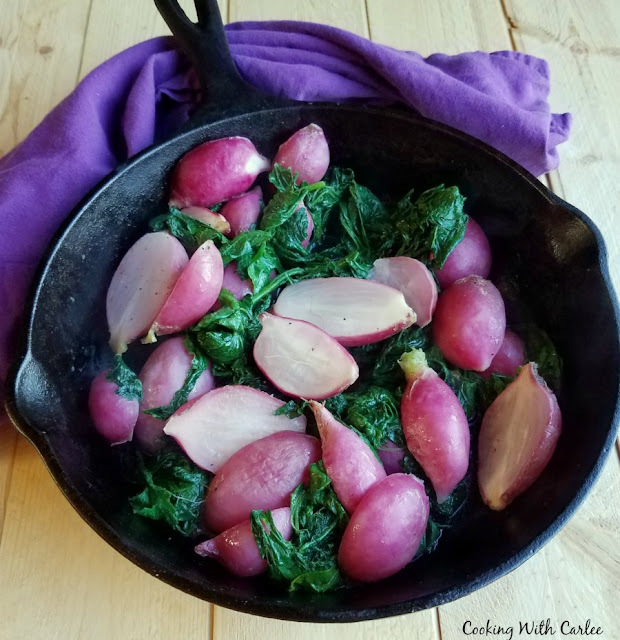 Toss with olive oil, salt and pepper and place in cast iron skillet or other oven safe skillet. Roast for about 20 minutes, stirring (or just giving the pan a couple good shakes) half way through. They should be fork tender when you remove them. Place them on stove and top with chopped greens. Cook over medium if needed to wilt the greens. Finish at the last minute by melting butter over the radishes and a sprinkle of sea salt. This is exactly my experience. I never did like radishes until I saw someone roast them on tv. We happened to have some for Pops growing in the garden. Although I was skeptical I decided to give roasting them a try. Now we grow them for salads and for roasting. So good! They really are quite good! And the greens are good too! Roasted Radishes have been on my list to try, and I just never get to it. I really need to make this! You HAVE to try them! They are so darn good! That's it! I'm gonna just have to roast some darned radishes. I keep hearing about them, and these look delish!! Do it! Do it! Do it! I hope you love them! I hope you have some soon! We really enjoy this version. I really should try them other ways, but it's hard to not go with something you know you love! 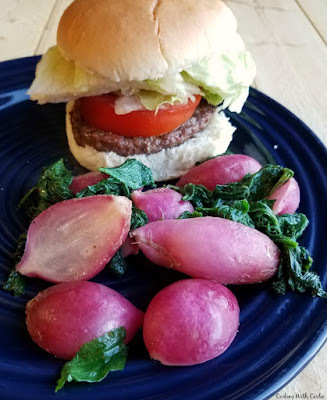 Radishes are so darn good this way. Thank you! Wow Carlee these roasted radishes look so good! It is my favorite way to have a radish! Thanks, Julie! 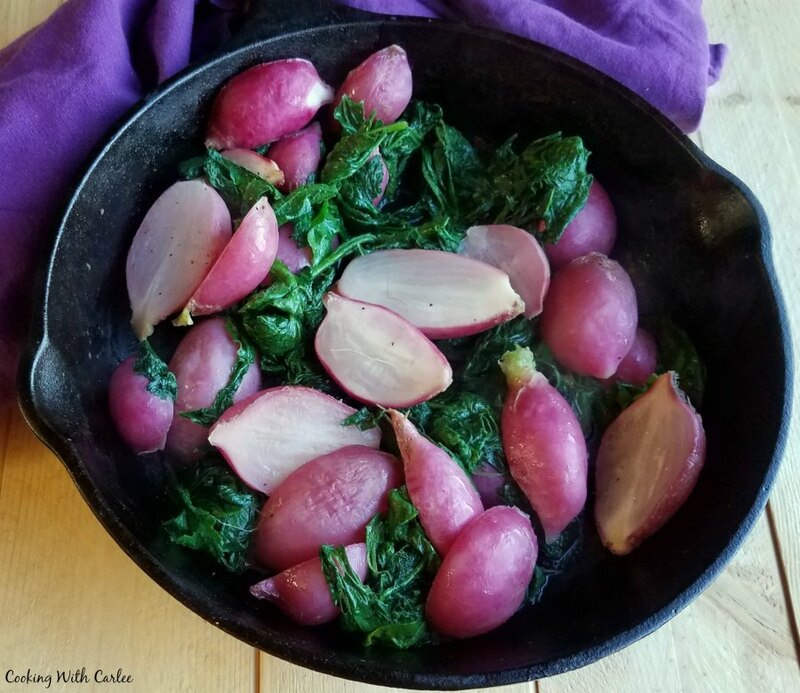 Wow I have never thought to eat radishes this way Thanks for the recipe~Thanks for linking up to Merry Monday! Sharing on Twitter! Have a great week! They are so good roasted. I hope you give it a try! Thanks, Kim! I just had to tell you that I'm going to try roasting my radishes tonight. I plant them as a companion plant to attract bugs even though I'm not very fond of peppery radishes, and I just pulled a huge amount of them out of the garden. Mine are really peppery due to how hot and humid it's been, so I'm hoping that roasting them corrects that a bit. I never would of thought of roasting them, great idea! I hope you love them! I do like early spring radishes fresh, but this time of year roasted is the only way to go. You'll have to let me know what you think!! You definitely should! Fresh spring radishes are delicious!